Welcome to the Kanab Heritage Museum! Kanab, a beautiful and friendly small town in southwestern Utah, is very fortunate to have a wonderful resource to share with our visitors! If you would like to see first-hand what life was like for native people, early western explorers, the pioneers and early settlers, you will find that history can be more clearly understood by spending time in Kanab's Heritage Museum. We have thousands of artifacts on display! 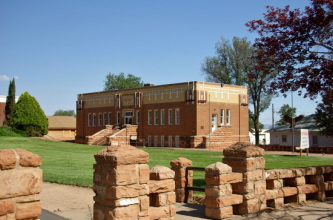 For families who have descended from the pioneers and still live in Kanab this museum is a treasure-trove of family history! Let us bring the past to life for you and your children. The Harold Mace Collection contains thousands of photographs and negatives that document every aspect of life in Kanab spanning several decades. Below are just a very few of these marvelous photos. You will be fascinated by the depth and breadth of this work, and you'll enjoy finding many of the places and people you know among them - Learn more!